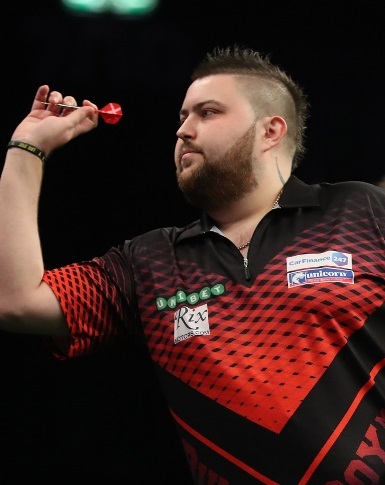 Team Unicorn star Michael Smith is bidding to maintain his advantage at the top of the Unibet Premier League table as the tournament visits Westpoint Exeter on Thursday for the season's fifth league night. Smith is the only player to have recorded four wins so far this season, having extended his unbeaten record with victory over Simon Whitlock in their top-of-the-table clash in Berlin last week. The former World Youth Champion comes up against Raymond van Barneveld in Exeter and is aiming to retain his two-point cushion at the top of the table. "Things have gone really well so far but I'm not taking anything for granted," said Smith. "I still feel I've not played my best darts yet and I'll have to do that against a class player like Raymond. "I've been taking my opportunities so far and if I can keep doing that hopefully I'll get another win." Michael’s mentor and Unicorn teammate Gary Anderson World Champion Rob Cross is looking for a win over World Champion Rob Cross and leap-frog him in the Premier League table. The Unibet Premier League will be broadcast live on Sky Sports from 7pm on Thursday night and shown worldwide through the PDC's international broadcast partners.